Her mother tongue is German and she studied French and English Conference Interpreting at Charles University Graz, Austria. In 1992, she moved to Prague where she worked as a lecturer of German as a foreign language, and at the same time learned Czech. In 1999, she took successfully part in an interpreter competition at the European Court of Justice in Luxembourg, and in 2004 she joined their staff. Since then, she interprets at court hearings from 5 languages (French, English, Czech, Slovak, Spanish) into German. Here it is: an interview with Angela Rogner, an interpreter with the Court of Justice of the European Union. 1) You work as an interpreter in the Court of Justice of the European Union since 2004. Could you explain the process of applying for a job and the stages of recruitment for your position? I took part in a competition. A competition is a selection process for staff of the EU institutions, handled by EPSO, the European Personnel Selection Office. At that time, every institution still had their own selection procedure. In 1999, an Austrian friend told me about a competition for interpreters at the European of Court of Justice. We decided to go, without big hopes to succeed. The Court of Justice seemed like a mysterious institution and we were sure that the exams would be difficult. They consisted of consecutive and simultaneous interpretation from three EU languages into our German mother tongue. My three languages were French, English and Spanish. My friend unfortunately failed, but I succeeded, to my big surprise. For several years I was on a reserve list for a post at the Court of Justice, and in 2003, before the major enlargement, I got an offer to become a staff interpreter in the German booth. They knew I had Czech in my language combination, and the institutions were looking for people with enlargement languages. Later, I also started interpreting from Slovak. On 31 December 2003, my family was packed up and we left for Luxembourg. 2) Did you study law or is this not a prior condition for becoming an interpreter with the CJEU? I have a university diploma in Conference Interpreting from the University of Graz, Austria. My diploma thesis dealt with the terminology of international treaties, but I did not study law as such. Nevertheless, law has been part of my professional life, in some way or another, during my time as a free-lance interpreter in Austria, and as a translator for a Czech law firm in Prague. A formal law diploma is not required for CJEU interpreters, but a certain knowledge of and an interest in law are an advantage. Of course, there are posts in the EU institutions where a formal law diploma is required. 3) What does your work consist of on a daily basis? Do you have to prepare for specific court hearings? The bulk of my work is preparation. Every week, I am assigned to a number of hearings in cases where German is needed. In order to interpret well at these hearings, I have to be well prepared. The interpreters have access to the case file and study the documents submitted to the Court. A case is not only about specific terminology in various languages, but mainly about a legal dispute that we should understand. What are the parties arguing about, what is the core of the issue? What arguments are put forward? Without sound preparation, we would be unable to adequately interpret a hearing. Proceedings at the CJEU can be brought in any official language. Very often, we have a manifold linguistic situation: The language of the proceedings is, say, English, but various governments of EU Member states intervene, and they will all speak their languages: Greek, German, Lithuanian, French, or Polish. 4) Could you explain to our readers, from your own experience, how the principle of impartiality of the judges works in practice? Did you experience anything that could be considered as „unusual” during the Court proceedings? Sorry to disappoint you, but I never experienced a situation where the judges of the CJEU would not be impartial. People sometimes think that the Polish, the Czech, the Hungarian, the Austrian or any other judge are „loyal” towards their own countries. If this were the case and the Austrian judge would decide in favour of his home country in a case where Austria is sued by the European Commission, European law would be invalidated. The judges operate solely on the basis of European law and interpret it in the light of the given case. Anything else would undermine the very principle of EU jurisdiction. 5) What is your position on the current EU proceedings against the Polish government concerning the rule of law and Poland’s judiciary? Is that a discussed issue among the staff of CJEU? As an interpreter, I have to be impartial. This does not mean that I do not have my own opinion on various matters, but when I work, it must not shine through. My job is to faithfully and convincingly render the arguments of the speaker in the target language, whatever the speaker’s position is. I will not be assigned to the hearing in the case you mentioned, since it will probably be dealt with in Polish and Polish is not yet one of my working languages. Maybe I will have to disappoint you again, but I am not familiar with the precise pleas in law brought against Poland by the Commission. Of course, the events that have taken place in Poland are discussed in the European press and by people interested in the developments in Poland, but there is no special discussion at the CJEU. I believe that judicial independence and the irremovability of judges are very important for the rule of law. 6) Finally, what would you advise to students and graduates who aim to work in the EU institutions? Get a university diploma in the field you are interested in, go abroad, learn languages, apply for an internship with the EU institutions. Check the websites of the institutions where sometimes temporary posts are offered. Take part in an EPSO competition. Don’t give up if it does not work the first time. Try again. Don’t lose your enthusiasm! We need young people who believe in the EU, you are Europe’s future. Additional remark for young interpreters: The CJEU offers also interpreting internships, check out the website www.curia.europa.eu. Good luck! In our unusual interview we would like to introduce our readers and followers to a very extraordinary person – Professor Bogusław Marek, OBE. Professor Marek is the John Paul II Catholic University of Lublin (KUL) Rector’s Plenipotentiary for Disabled Students, the founder of Center for Adaptation of Teaching Materials for the Blind and the inventor of ‘English for the blind’ program. 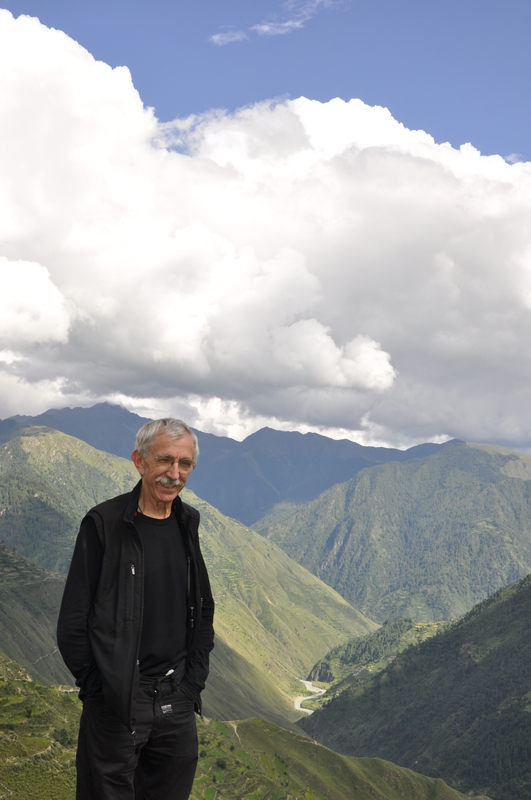 For Professor his work of more than twenty years is both a mission and a passion. He has invented numerous educational toys which are used by him on daily basis as tools to explain difficult concepts based on visual experience. In 2002 he was honored with The Most Excellent Order of the British Empire by the Queen Elisabeth II for his devotion to his educational effort. We hope the following interview is going to encourage you to get yourselves familiar with the Professor Marek’s activity and maybe even support his initiatives. 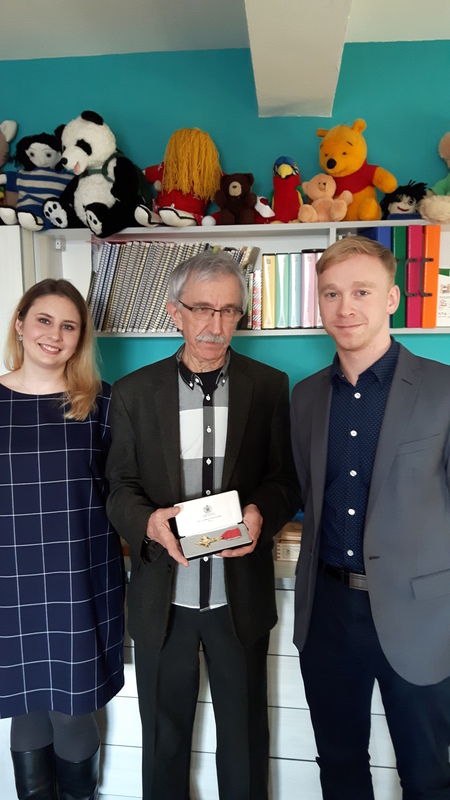 Emil Wojtaluk: You are the father of ‘English for the blind’ program and the founder of the Center for Adaptation of Teaching Materials for the blind at the John Paul II Catholic University of Lublin. Could you please outline the Center’s activity? Real objects and models support computer based English language lessons with blind children at KUL (© Prof. Bogusław Marek). Professor Bogusław Marek: Due to the fact that the blind are recognized as a group with so called special educational needs, our activity is all about helping them with functioning like they weren’t blind. For instance, when someone sighted needs a book – he goes to the library, borrows a book and reads it. This is impossible for a blind student unless there is a copy of the book in a Braille or digital format. The blind students remain disabled persons but we try to take their disability away. Sometimes, at meetings and conferences, I surprise people saying that here at the University our policy is not to have any disabled students. I can always hear a murmur of outrage: “how come, at KUL”? All I mean is every disabled person is welcome here, but we do our best to make sure that they can function as regular students. If a student in a wheelchair is able to use a lift to get to the classroom – he is not a disabled student anymore. This also applies to blind students – if they have their books and tests adapted for them, they are no longer disabled students. This is what the Center’s activity is about and I have to say we have a lot of work. As of today, there are 15 blind students enrolled at the University. Let’s say each of them attends 8 classes and there are 10 books needed to be read to prepare for them – it makes 80 books for one person. This is a tremendous amount of work. Last year our Center transformed 70K pages of regular text into Braille or digital format. Plus texts written in Braille take approximately 3 – 4 times more space than the regular font. Our students are equipped with personal digital appliances, Braille notebooks with a small screen. Our specialty is also converting graphics: graphs, diagrams, charts or maps. We are ready to prepare boards and plans in a tactile version. Maria Moroniak: Do you remember the specific moment in the past when the project was born? Was there any milestone, which you remember as a propulsion of the initiative? Or was it all about arduous, day-by-day work? Bethany Centre for blind children in Meghalaya, India (© Prof. Bogusław Marek). Professor Bogusław Marek: I think I need to mention a couple of milestones here. First of all – you two are probably too young to understand that – a middle-age crisis. When you are a guy in your forties, you have made your PhD and your habilitation, thoughts like “can I achieve anything more at this university?” cross your mind. I have always been afraid of a vision that I could end up like someone I met years ago during my studies at the University of Warsaw. The gentleman I am talking about was apparently tired with his life and his students and all he was doing was reading out loud boring lectures from yellowed pages of his notes. I didn’t want this kind of academic death to happen to me. I needed a shot in the arm. I wasn’t frustrated yet. I just could have felt I needed more. Then it happened that I was staying in London with my students and once noticed a poster of a charity working for the blind. There was a girl holding a model of Tower Bridge in her hands and the sentence “Amy will never see the sights of London” written below. It made me think: “hold on… if Amy has been blind since she was born, she’s got to have very good hearing, memory and concentration. And these skills are extremely useful in interpreting or teaching languages. The only thing Amy may be missing is a foreign language”. And then I thought I could offer English to the blind kids in Poland. So said, so done. I visited this foundation the same day and two weeks later I was a tutor on a camp for blind kids. This was supposed to let me know if I could handle this kind of work.After coming back to Poland I went to Laski (a special school for blind children). I would teach English to kids and kids would teach me about being a blind person. After two years of working in Laski I got a scholarship and went to England to do a specialist course in visual impairment. It was before Poland’s accession to the European Union but they already had some preparatory programs for the members-to-be and I was one of the first beneficiaries of the “Tempus” program, which let me complete my visual impairment studies at the University College London. After coming back to Poland I found out that my new British qualifications were not valid in Poland but it didn’t put me off. I started a “pirate” unit here at KUL, thanks to a green light from the authorities of the University. And this was when, in 1995 the Unit of Typhlodidactics of English was established which later included Alternative Comuniation. We started with training teachers, later on first blind students appeared, so did the need of preparing materials for them. In the beginning it was more like outwork – we only had a tiny Braille printer. And then we got invited to participate in a program “Per linguas mundi ad laborem” co-organized by the University of Warsaw and the Maria Grzegorzewska University (Academy of Special Needs Education). The project was planned on a large scale, including creating centers for adaptation of materials at KUL and the University of Warsaw (UW). We split the roles up – Warsaw focused on converting regular text into Braille format and we, due to my personal experience, focused on graphics, obtaining new, very expensive devices for creating high-class, long lasting tactile graphics. That project was my second milestone. 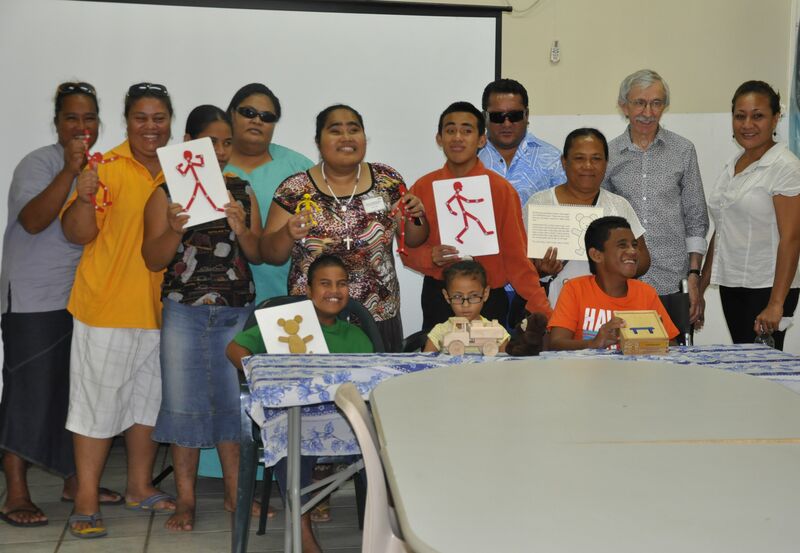 Group photo on the last day of a tactile graphics workshop in Apia, Samoa (© Prof. Bogusław Marek). I think I need to mention the third one too. It happened during my studies in England, which were supposed to last two years, though I completed them within one year since I didn’t have other responsibilities. I was asked to give a speech during the inauguration of the academic year. Back in that time KUL was known as the only independent university from Western Berlin to Tokyo, so every embassy sent a high-ranking representative, even ambassadors themselves, in a gesture of support. I was given an opportunity to speak in front of such a noble audience, so I had been working on my twenty-minute speech for three months. I was honored with applause, but the most glamorizing part was talking to all these guests in person. There was a line of ambassadors asking me how they could support my initiative. Thanks to that morning we got equipment sponsored by the Canadian Embassy and I could go on a very important course of tactile graphics organized in Australia and funded by the British Embassy. Thankfully I was quick enough to react by saying “Your Excellency, the course is useless unless I have funds to buy the equipment for producing tactile graphics” – so we got money to buy that too. When it comes to embassies, there was also another interesting situation. Once I was parking my Polish car in a London street and saw two couples with their children walking by. When they saw the number plates they approached me and started a conversation, talking about my work with blind kids. Soon they turned out to be members of the Polish Embassy willing to donate some spare money to charity. The next day I visited the Consulate in London and left it with a cheque for 26K pounds. The money was spent on equipment which was soon sent from England to our Center in Poland. There was also the fourth milestone – thanks to a project “Równy Start” – “Equal Chance” we got enough money to buy more devices for students with various disabilities. Emil Wojtaluk: You have traveled a lot to work in so many different places. 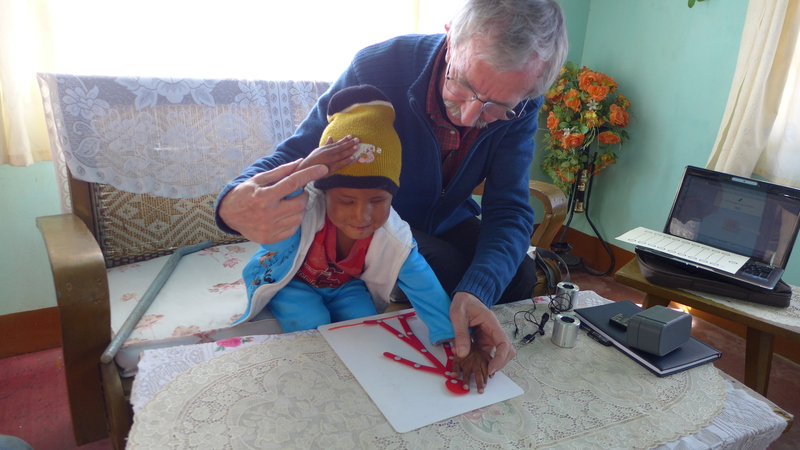 Have you noticed any differences in conceptions of helping the blind? Do you think there is an awareness gap between Poland and other countries? 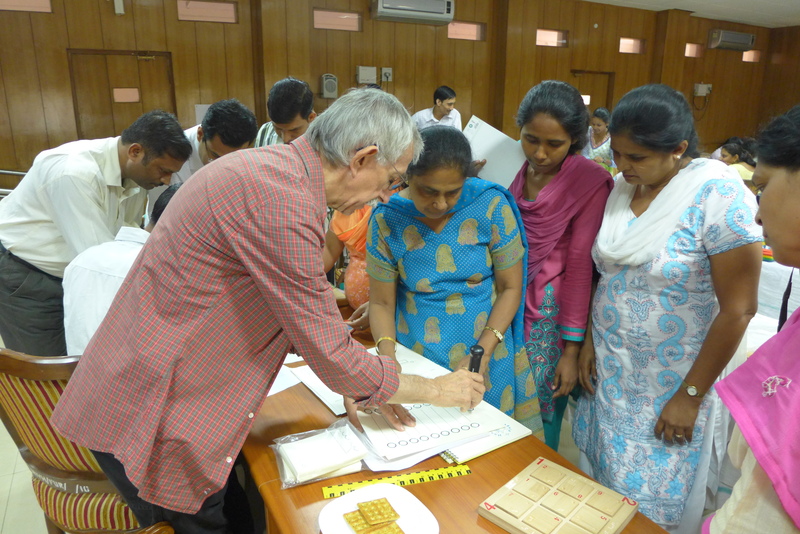 Reasearchers from India Institute of Technology are getting acquainted with new technologies for producing tactile graphics (© Prof. Bogusław Marek). Professor Bogusław Marek: In the beginning of the nineties English parliament enacted very significant regulations – a kind of a manual for every institution interested in helping the blind. Thanks to these guidelines everyone knows what one is supposed to be doing – for example a school headmaster knows what his duties are and what source of funding he can use. They leave no space for latitude of interpretation, there are no situations when people keep saying that would be good to do this or that, but no one knows where and how to start and in the end no one feel responsible. I would say that their system works better. But there are inequalities too. Some parents of blind children decide to sell their house and move to another, richer county, where they can get better support from the government. 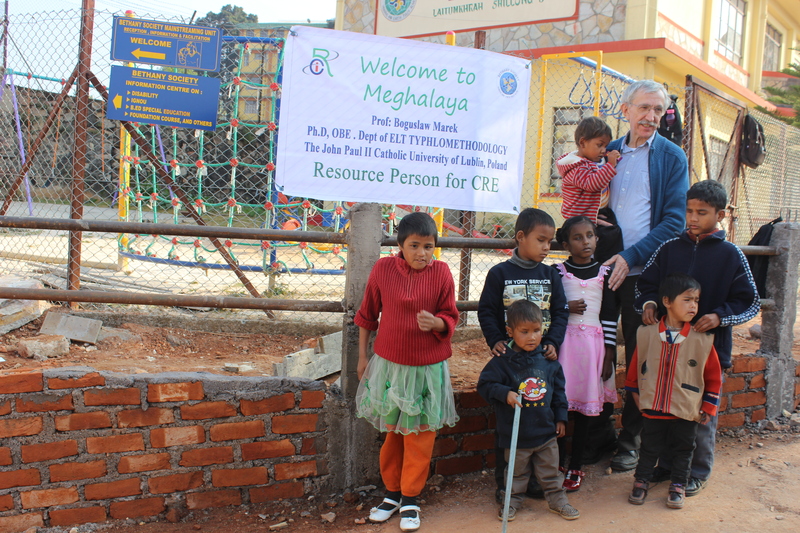 When it comes to attitude of a society to a blind person, I have never experienced hostility, even in such exotic countries as Nepal or India where being blind is often associated with being punished for sins. I have also seen exaggeration – in the United Arab Emirates local kids get top world-class support, for instance, once I met a boy who didn’t even know how to use his electronic devices. I suppose that was because his father would buy him every latest appliance available on the market so his son never took time to get familiar with using it in a proper way. So in fact the boy had all this equipment stored without the knowledge of how to use it. On the other hand, the vast majority of blind kids living in the UAE are the kids of immigrants working there and they receive no support from the government, they can only count on international organizations. Maria Moroniak: Your program dedicated for the blind makes entering the job market much easier for them. Do you know what happens to your students after they graduate, do you often hear from them? 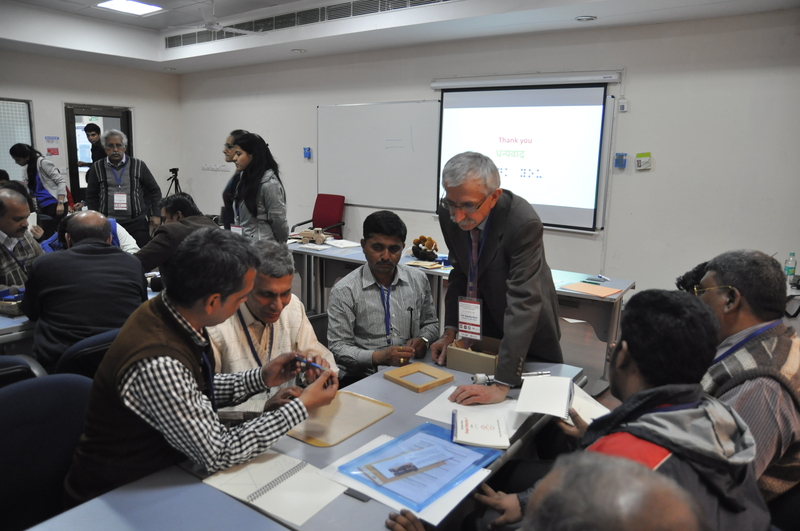 Teachers from the North of India are learning about innovative educational resources for blind learners (© Prof. Bogusław Marek). Professor Bogusław Marek: We don’t run any records, but maybe we should. We keep in touch mostly because we are on friendly terms. Almost every graduate gets a job after completing the studies – sometimes they teach English or earn some extra money offering private lessons. Due to their strong interest in electronics, they also work as other blind people’s consultants helping them to learn how to work with devices for the blind. There is an interpreter. And there is also a person who undertook English studies to learn the language so she can start her dream studies – Psychology. She became a clinical psychologist and even has been awarded by the British National Health Service for her work. One of our students, owner of a deep, warm voice unfortunately doesn’t work for any radio station, but works successfully at the telephone customer service. Professional path chosen by our students depends on their determination. There are also passive people for whom enrolling on a course is enough or people who choose to study just to be entitled to get a certain type of help. Emil Wojtaluk: I’d like to refer to the previous question. As far as you are concerned, how important on the labor market for the blind is their education? How many of them work in their educated profession? 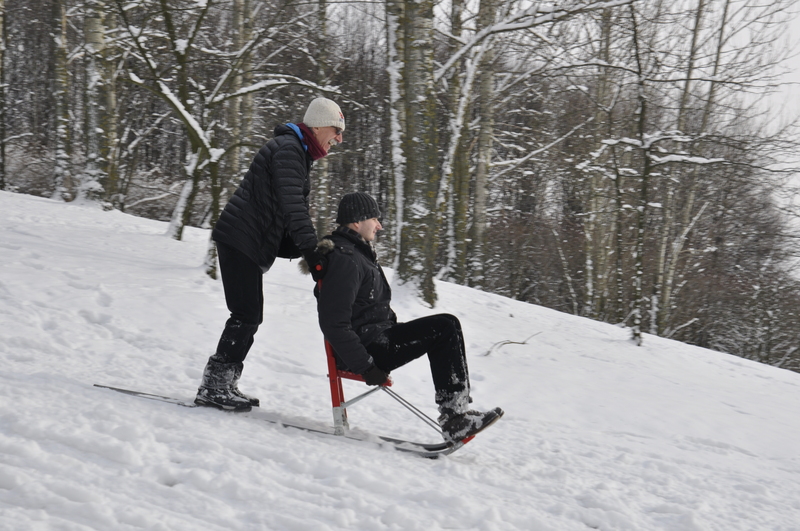 Kick-sled – winter sport accessible to both sighted and blind persons (© Prof. Bogusław Marek). Professor Bogusław Marek: Unfortunately, it does not look good. According to the data presented by the Polish Association of the Blind, only 10 – 15 % of the blind work and the situation isn’t any better in other countries. We should encourage employers to employ the blind showing them how they can benefit. Unfortunately there are misuses because of concessions the blind bring to companies, so some entrepreneur give a blind person a job just to make him or her a ghost-worker with a benefit for the company. The blind’s ability to fit in the labor market isn’t just based on their education but also on their attitude and interpersonal skills. Let me give a fantastic example by quoting our current English Studies student. When one day at the class she noticed that someone didn’t want to learn how a tactile map works, she asked her friend: “How do you want to know how to reach your destinations then? Every time you ride a trolleybus you are just going to count the shakes it gives you and then you’d know that you’re supposed to get off?!”. One day she came to our office asking if she could print something. It turned out she had made stickers to put on a windscreen warning drivers that if they keep parking their cars in wrong places, they will have their cars scratched by a blind person’s white canes. This girl is cheerful, always smiling, sociable. But there are also grumpy students for whom being a blind person seems to be an eternal excuse for anything. These people are going to have issues with finding a job no matter how educated they are. From the start they arose aversion or pity and that leads them nowhere. Maria Moroniak: Has any of your students ever joined your initiative working along with you? Professor Bogusław Marek: Of course! We had a wonderful PhD student who has temporarily moved to the US. She used to encourage and motivate our students, organize courses, theme meetings, trips, body language workshops. Each one of our graduates knows how to work with blind kids and if someone chooses to work with them he or she is definitely well prepared for that. Some of our students organize workshops in their communities. Maria Moroniak: so your idea is being continued. Professor Marek: If someone tries this kind of work once and it turns out well, one definitely gets hooked, there is no turning back. Once some lady teacher told me “Oh, I admire you, I am so soft at heart that I couldn’t be working with blind children.” I responded jokingly “My heart is a stone, so I can work with them with ease.”. It’s not about pity, you need a reasonable attitude. One needs to contain emotions. This eight-year-old boy (looking four) turned out to be a very bright student (© Prof. Bogusław Marek). Maria Moroniak: so is the job mentally overwhelming? Professor Bogusław Marek: I would say this job is invigorating. It takes creativity to face the challenges and figure things out fast. I say challenges, not problems, because problems bring you down and challenges cheer you up. I constantly feel a need to create something new and I believe that’s the reason I am still in a good shape. It happens that I have to do the homework. One day a blind boy told me that that day he had learned a new English word: transparent. I was wondering how I could explain this word to him… Later on I was working on figuring it out at home. And the best moment was when next time we met he left the class and told his mom “Mom, I already know what this word means”. Emil Wojtaluk: The Most Excellent Order of the British Empire – the supreme honour available for a non-British. Could you tell us the story behind it? Authors of the interview: Maria Moroniak (left) and Emil Wojtaluk (right) with Professor Bogusław Marek (© EUROpens BLOG). Professor Bogusław Marek: First I have to mention again that KUL was very important institution on the world stage back in that time. A lot of embassy officers, even ambassadors, were sent here to learn Polish language. And there is a tradition that when an ambassador takes his position in a country he is sent to, he takes a trip around the country to explore it. One of them came to Lublin to recollect his Polish language course at our university which he had attended years before. He also visited our workshop and he liked it. After a while I got a call from some high officer who invited me for a lunch here, in Lublin. During the lunch with the Diplomatic Secretary of the British Embassy I was asked a lot of questions about our program “English for the Blind”: about its beginnings and about its future. And that was it. After a while I got another phone call from the British Embassy. That time I was asked “If the Queen wanted to honor you with a medal, would you accept it?”. I can remember that I was in a rush because I had to go to a lecture, so I responded playfully “How could I say no to Her Royal Highness?” I hung up thinking “Medal? What medal?”. The Order of the British Empire received by Professor Marek (© EUROpens BLOG). 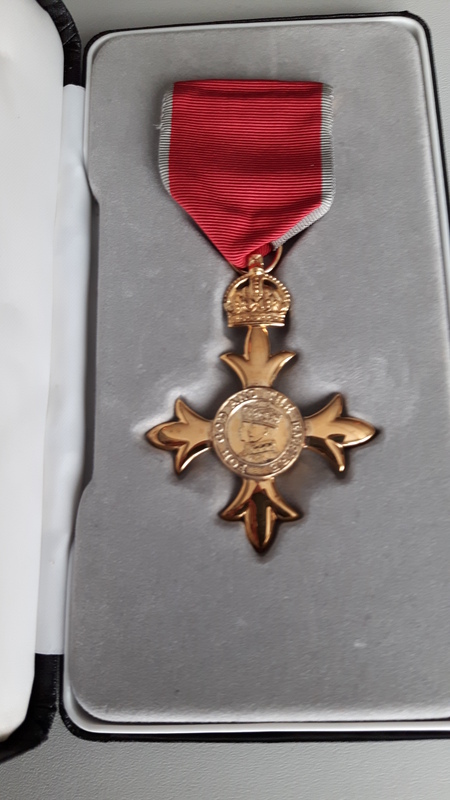 In a couple of weeks I received another message – that the Queen awarded me with the Order of the British Empire. I was asked to send in a list of guests I wanted to invite for the ceremony of decoration. I could choose between the British Embassy in Warsaw or Lublin City Hall, since there was a British Week scheduled then and all of the Embassy workers were going to come here anyway. I really wanted to invite my blind pupils – after all I was awarded thanks to them and, most of all, for them. The ceremony was held in Lublin City Hall. An officer of the army was holding my medal resting on a cushion. All of then-rectors of our University arrived, there were speeches, a bugle call, congratulations, a grandiose ceremony. I remember someone told me “You got an extremely important medal, use it wisely”. But I can also remember that there was hardly any information in the Polish media. Only a line and a half in the local newspaper. I am not saying I felt sorry, but later on when David Beckham got the Order I could see a huge difference – everyone was talking and writing about that everywhere! I have O.B.E. written on my business card and people sometimes ask me which Christian monastery’s acronym is this? In Anglo-Saxon countries such as England, New Zealand, Australia or Canada this status is really recognizable. This doesn’t mean they prepare a red carpet every time I arrive, although I have to admit it helped me a lot when it comes to contacts with western organizations. And also every year the British Embassy invites me for the Queen’s birthday party. Maria Moroniak: What are the Center’s plans for future? Are you going to take up any major initiatives worth exposing? Lessons a HEAD Nepal are organized in a multi-purpose room (© Prof. Bogusław Marek). Professor Bogusław Marek: Of course, some huge ones! I have already mentioned the project “Równy start” within which we are going to arrange a Center for Motivating the Disabled – I called it “KUL CAN”. Our team will be wearing T-shirts with the slogan “KUL CAN = You Can!” printed on them. We want to expand our activity and serve other universities and schools with our skills and well-equipped workshop, which is the best equipped one in Poland, even better that the one at the Maria Grzegorzewska (University Academy of Special Needs Education) in Warsaw . We also have signed a contract with Fund for the Blind of Laski to support their charges in starting studies, not only at KUL, but wherever they wish. We want to help them out with enrolling at their dream studies. I hope one day we could create a typhlodidactics unit at the University. We already have surdopedagogy (pedagogy of the deaf). Maria Moroniak: You have wide experience in working with the blind, how do you think, what can we learn from the blind? Humla is known as a hidden gem of Nepal (© Prof. Bogusław Marek). Prof. Bogusław Marek: I would say they teach us that the world does not end only at what we see. There are a lot of things hidden from our sight. We take shortcuts too often. We take a gaze at something and assume that we already know everything about the case. We firmly rely on our sight and that makes us unable to notice how this world manifests itself in so complex way. Let me give you an example of how a blind person describes rain. Once I met a man who told me that he feels very lonely when the weather is fine. He compared himself to a man drawn in the middle of a plain sheet of paper. And when it starts to rain, the sheet starts to fill up with other objects, because he can finally hear the objects he is surrounded by thanks to raindrops pattering on surface. He can hear a roof, a path, a dog leap stairway, the bushes – notice the tree-dimensionality of the world. I think that a contact with the blind sensitizes us to the world, makes us feel we can live more, absorb impressions we are surrounded by using other senses, not only our sight. The world does not end at what we can see. We are all aware what happened on 13th of November in France. Series of attacks caused great chaos and terror inside of France, but also influenced discussion inside European countries. How European Union should behave when thousands of immigrants are coming to Europe due to the war? Few days after terrorist attacks in Paris new Polish minister of European Affairs, Konrad Szymański, strongly presented future plans toward refugees. After changes in Polish government we were supposed to receive 6,5 thousands of them. The Minister admitted that he cannot see possibilities to fulfill quota system imposed by EU, according to which refugees would be divided among EU Member States. On the other hand, Witold Waszczykowski (present Chief of Diplomacy) tried to smooth things over and added that Poland will accept refugees quota system, only if a special safety standards on our borders will be introduced. Such objection can bring significant consequences and legal proceedings or, consequently, charge could be brought to the European Court of Justice. Austrian chancellor proposed that countries which resigned from acceptance of immigrants should be deprived of structural funds and special sanctions should be imposed. However, the European Union has not responded to this statement. The strongest criticism toward this attitude came from President of European Parliament. Martin Schulz in ARD television, stated that Polish approach is at least unfair – when Poland feels threatened by Russia it asks for more funds and army, in such a case Europe is supportive. When Poland needs more funds from the European Union it gets them. In September (2015) special meeting of the Polish Parliament was held, during which Jarosław Kaczyński stated that German policy created great magnet on immigrants and this problem concerns only them. Response of EP President appeared immediately. In such situation the statement that problem of immigrants is only German concern should never appear. Solidarity is not a matter of looking for what is convenient. But then you can’t come and say that the refugee problem is a German problem and we have nothing to do with it. Solidarity is a key question and (not subject to) cherry picking. (President) Schulz’s words are an example of German arrogance ,We’re talking in Warsaw, which was destroyed by Germans. In (Warsaw’s) Wola (district) 50,000 men, women and children were murdered by officers of the German state. The President of the European Parliament in an interview for German television carried the statement that if Europe of nationalists wins, the Europe will be in their hands, not only in the matter of migration. Europe needs morale of solidarity, if it is necessary it will be imposed by using force. Does this statement shows that EU is desperate and has to impose solidarity of Member States? Immigration policy has been existing since the very beginning, but this time opposition has been strongly expressed by new Polish government. On the other hand new Polish Prime Minister, Beata Szydło, agreed to welcome 7,000 of immigrants. This step can slightly remove bad attitude of EU institutions toward Poland. Is it end of political differences between Polish government and authorities of the EU? We will find out in the near future. 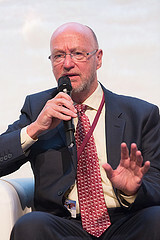 Adrianna Brzozowska and Emil Wojtaluk talk with South African Minister of Science and Technology, Mr Derek Hanekom at the European Innovation Convention 2014. Emil Wojtaluk: What are the ways of encouraging young people to be more active and what do you think of EU policies for entrepreneurs? Derek Hanekom: Let me start from the second part of the question. I can’t really comment on European policy but I do know that one of their priorities is to encourage young entrepreneurs to come forward. I wouldn’t be able to speak with authority on what their instruments are and how they are trying to encourage it. I speak for my own country. The short answer is that we are not doing enough in our own country, we need to do more but I’ll tell you some of the things that we’re starting to do. Firstly, doing it often with private sector is to create opportunity for good ideas to be brought to the table. So we have our big electricity supplier for example, we work with them and organize an annual event, and it’s an expanding annual event where schools across the country came with the school projects. They are giving awards in the variety of categories and they are able to show case of their project in Johannesburg but it’s all done regionally first. I must say it’s quite a lengthy process but at the end of the day interested people see their projects. So you may have a group of kids that designed energy efficient home or designed a solution to having affordable clean water in your house, better filtration unit or better waste management. They come up with the most amazing ideas! What we can do institutionally and should be doing more of, is to create opportunities not to set schools but beyond schools, where you want to start a very developing entrepreneurship that people have the central point to take the ideas too. Those ideas, no matter crazy they might seem are being observed. If they are really nothing special, people will get back to them and say “this is why we think your idea is not gonna make it”- because not all ideas are good ideas. The principle of people generating ideas – that’s a good thing, doesn’t matter what. Amongst them, when you see some potential in an idea, we have state institution which we have recently put in place that will give the support that it needs to develop its next stage. It’s a fairly high risk. You get to the next stage where you might approach a venture capital provider, which could be a state-run institution or private sector venture capital provider. That’s very first stage when you are not likely to get anyone because the risk is very high – so we have an institution in South Africa called Technology Innovation Agency. It gets some annual budget, we’ve accepted that it goes in the early stage of innovation and is prepared to face risk. We are not going to take actions against entrepreneurs because there is a high failure of it. Because we know that out of 20 presented ideas 19 can go nowhere, but one can be the really winning idea. Adrianna Brzozowska: So how this agency(Technology Innovation Agency) distinguish good project from other bad projects? DH: At the end of the day a judgment should be made. People knowledgeable in the particular area have to make the judgment. The product may have to be tested so we do have a kind of a bureau of standards if it reaches that stage. The idea must contain some kind of scientific merit, if it’s something that is being tried and tested and there is kind of a doubt – all I’m trying to do is to put my name on it and then I say “you can do it but you have to do it on your own”. Because there is nothing novel and so on. You can’t put state money into anything and everything, you cannot. If there is genuinely different, more energy efficient housing design, for as an example. Or there is genuinely interesting idea on the development of a new application. There have to be some judgment and some research done. In fact there’s a surplus of such applications anyway. But the people looking at it will have to say “it’s very interesting”, we are very satisfied that there is a kind of market niche. It can give commuters an information in Cape Town when the next bus is going to arrive, after research we can find that there is no such application in that city. Then we say “excellent, we think that you have a good opportunity, we can fund you to take it to the next stage”. EW: The last question is about innovation because this convention is about innovations and innovators. So what is your own definition of innovation, how could you describe it? DH: I would agree with somebody because I keep reading definitions of innovation but I would say – the starting point is true but it goes beyond. Critical feature for innovation is underlying information and knowledge. But it’s taking existing knowledge and attaching to it creative thinking and creative ideas which will result in new, novel, useful product or service. I would like to go bit beyond that to say – innovation could be simply smarter ways of addressing problems, better ways of doing things, that’s innovation as well. EW: Thank you very much. DH: Thank you and good bye. 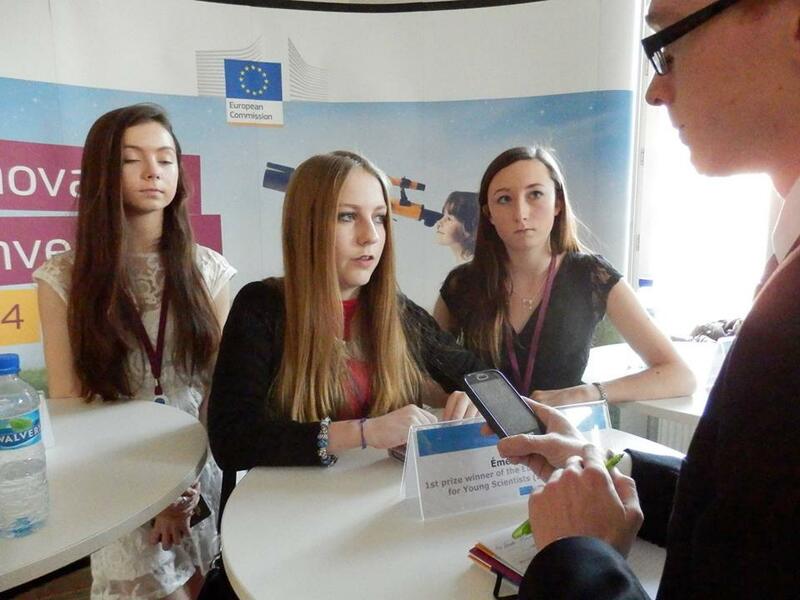 Emil Wojtaluk talks with the winners of European Union Contest for Young Scientists 2013 (EUCYS): Sophie Healy-Thow, Emer Hickey and Ciara Judge. They were awarded for using natural bacteria to speed up the germination and subsequent growth of cereal crops. Emil Wojtaluk: How did it start that you won this award? Emer Hickey: We started when we entered a national competition which is called BT Young Scientists. So there are three of us: Sophie, Ciara and myself. We just wanted to go to the competition which is held in Dublin and what we did we used a natural occurring bacteria called Rhizobium and we applied it to wheat seeds, and we made them germinate faster. Then we won a national competition and we got the opportunity to represent Ireland in the European Union contest. Because of that we did a lot of work in the summer to improve the project for that…and you know, we went there and we won first place. EW: It’s very specific area of work and takes a lot of effort. So who helped you to reach the goal? Because you need some funding, you need some scholarships, how does it work? EH: The competition is well known in Ireland so we went to the University that is near of us and we asked them to show us how to grow bacteria, and how to work with bacteria so they showed us that. Then our science teacher helped us, he told us about the competition and then we just did it ourselves. EW: And no help from non-governmental organizations or something like this? Ciara Judge: We did get sponsorship of equipment from certain companies within Ireland because the competition(EUCYS) has a very good reputation. So when they found out we are doing a project for this competition, they were very happy to sponsor us. That was more material support so for example we were allowed to use the machines of one pharmaceutical company and we also got some lab equipment from another. EW: Thank you very much and wish you a good luck. Ewa Krakowska and Emil Wojtaluk talk with Professor Zbigniew Zaleski, Polish psychologist and Member of the European Parliament in years 2004- 2009. Ewa Krakowska: Before the adventure in Brussels, you were successful scholar and lecturer at the Catholic University of Lublin (the job that you currently continue). Which occupation do you find more fulfilling? Zbigniew Zaleski: Tough question. With the first one I feel stronger connection. I worked hard and I did all I could in this field. But it was pleasure, because I met many people posing questions. The essence of science is asking questions, those that are most basic and valid- they are still deep if we look at my profession, psychology. It interests me, I would not change my job. Throughout five years of working in European Parliament I slightly gave up my academic work, although I managed to write a book called: „Psychology of support for New Europe”. Answering the question, what I value more I would say that science is deep, rich and also occupies our minds. Many generations add something to its development, especially in psychology. For many years it was my way and identity. I identify myself with work at the University, with students. It keeps me still so alive. I highly value this way of life. It’s not bad to be politician. You became so called VIP, it’s really comfortable. This occupation is easier than being a scholar. You may fail. In the world of science you must confirm your talent and knowledge. Political world functions other way. But I remember the times when I took advantage of being Professor in European Parliament where there are many other professors. I got along with them. As the scholar I was asked to share my opinion on issues like: abortion, circumcision of girls or adoption by homosexual marriages. As we can see my academic formation was not abandoned at that time. Sometimes I could even gain something because of it. Emil Wojtaluk: Do you observe the work of Polish representatives in the European Parliament Mr Professor? If yes, how you can assess it? ZZ: If you are inside you live it. After the loss I have been replaced by Professor Kolarska-Bobińska. I do not know what duty she fulfilled there, I must just see it. When I will enter there, I will quickly learn what is the status quo and I will participate in this Parliament as before. For the moment I observe it from outside like every citizen through the lens of hits: “What will happen?”, “important voting, speech”. I am interested in speeches of people that I know, for example the President Shultz – is he still a tough guy. I noticed that the role of Nigel Farage – critic of the Union, has grown up. His presence is necessary, because he sharpens the feeling in the others. And because I was there, I feel the spirit of time, I know what values are important and who is with who. Recently I was delighted with the news how much money we will get from EU budget for our Polish affairs. It was a satisfaction, thanks to this support we can develop continually. For now, I cannot imagine ourselves not to be in the European Union, even though I know the Union is not easy. It is good that we are there and we have our say. EK: Are you going to continue the work of Professor Lena Kolarska-Bobińska or to propose your own initiatives? ZZ: I am going to find out what she has done in our region. Good practices I will eagerly continue. For me, as a scholar, especially appealing is activity connected with youth. It’s not my desire to overwhelm them with EU, but just showing how to exploit all the possibilities they have in offer from the institution. I want to promote communication, direct contacts, languages. Previously I organised the project „Englishman in the family”. Somebody from Great Britain was going to Poland and was living with the family, so the kids could pick up some language skills. Then such a person was like Polish ambassador in homeland. So I guess I will think of the activities I like, in which I have the experience and some successes.